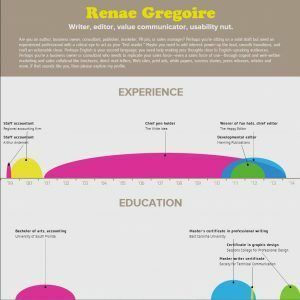 I’d been thinking about rewriting my traditional resume for some time when I came across a site for visual resumes: Vizualize.me. I loved the idea of presenting my plain, boring data visually, so I allowed the system to pull in my LinkedIn data, and voilà — a visual bio data! Although a great concept, the presentation provided by the vizualize.me system (and a few similar systems) did not appeal to me. So I hired a designer to create a visual resume in a style I liked. And I love the result! Heads up: Automated human resources systems won’t like your visual bio data, so if you’re planning to create one, share it only as an “extra,” maybe while you’re sitting across the table from a prospective employer or client. Stick with the traditional text-based bio data when you apply for gigs so that your data gets pulled into a company’s recruiting system. Staring at a blank page? Visit the Writing section of this site. What a fabulous person to work with! 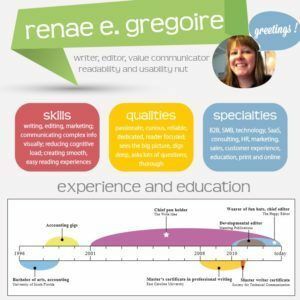 If it's written word, Renae can help you – she's done everything from straightforward editing to taking our raw, unformed ideas and turned them into fabulous marketing content. What's more, she sets expectations on the amount of time projects will take, is very responsive with our questions, and ALWAYS meets her deadlines.